A Pegasus foal, based on the features of a 6-month old palomino. Nice! That's what I call a good looking dude. This foal is sooooooooooo realistic and sooooooooooo cute! You are amazing! This foal is amazing! God bless you! What a talent! You are amazing! I love this picture! The foal's face is so realistic! Great job! That foal is so cute! The pegasus Foal is so cute, I love the little wings. This drawing is soooo cute!! 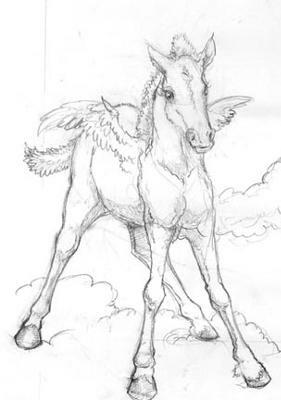 And really realistic, considering the fact it's a Pegasus! Great job! soooooooooooooooo cuteeee! i love it! i really need to practice drawing foals. that is ADORABLE! I wish I could draw like that. this is awesome! can i trace it of my laptop? that's awesome pic!! sooo cute as well. Pretty + nice wings. LOVE IT SOO MUCH!!!!! Your drawing is amazing! I wrote a series about pegacorns (unicorn pegasus). I can draw horses too. But yours is amazing! Hi my name is Jennah and my favorite animal is HORSES. p.s: your pitcher is so cute! ahhhhhhh OMG OMG OMG! i LOVE it! it is SOOOOOOOOO CUTE!!! that horse is so so so cute! I LOVE IT!!! COMPLETELY ADORABLE! I'm ok at drawing horses but this drawing is AWESOME! Two thumbs up! that is awesome, you are talented. i am a horse fan but your pic looked real. you're soooooo cool, i wish i could draw like that. that is so cute and a great drawing. I think that this is beautiful and unique and you should keep your awesome drawing skills going! I'm a wrestler and the only girl too. Well the only girl that was placed in the classics. I got 4th place out of 40 kids. So I think that it was pretty cool!!!!!!!!!!! I Love your picture! It's amazing! Have you tried to enter it in a contest? I bet it would win 1st prize! Some of you guys are super mean, the pic is great keep drawing it. I love it! I really would like to use it! it's so real! i love the drawing. like a bunch before you, you are lying about your drawing. Lookie at what I found!!! That is so cute! I love it I think it will be perfect for a gift or something it's just something amazing that stands out in your room! OMG!!!!!!!! this picture is soooooo adorable!!! YOU ARE AMAZING!!!!!! i draw too but not that well. This is an awesome pic! Can I get your autograph? I saw this picture on google a really long time ago and if you drew it, it's really amazing!! :D I used it in a story I wrote that's a bit corny. Oh My God. That Is Beautiful. I Could Never Draw A Horse Like That. i love it! it's the best! your good at drawing! That's sooooooo cute! I'v gotten lots of tips from that picture. It looks real!